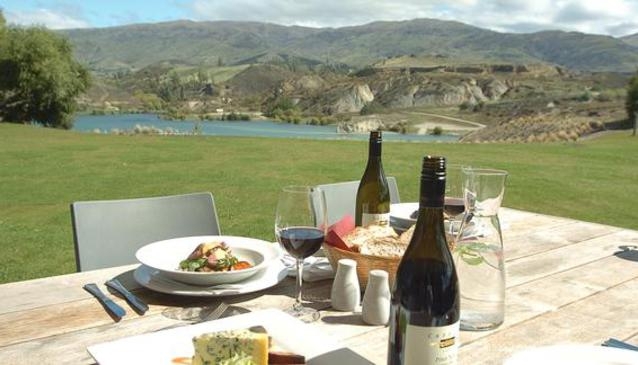 Carrick Wines is located just outside of Bannockburn, specialising in Pinot Noir. A spacious cellar door welcomes guests while the restaurant enjoys a picturesque setting overlooking the Bannockburn inlet. Established in 1993, the Carrick Vineyard offers tastings and sales of its range of Pinot Noirs, Chardonnays, Rieslings and Sauvignon Blancs. The onsite restaurant has a decent, local menu, that provides diners with helpful tasting notes on which wines to match with which dishes. The seasonal menu includes a choice of small dishes, platters to share and mains that features beef sirloin, duck confit, seafood and potato gnocchi. Restaurant: Monday to Sunday: 12.00pm - 3.00pm.